Now is the time to get your hyacinth bulbs ready if you want them blooming and beautiful for spring. They need a cool period of at least 14 weeks to form roots and prepare for blooming, so pot them up (or put them on forcing jars) and keep them in cold darkness (35º to 45ºF) until the rest period is up. If you have no other place that provides these conditions, you can use the refrigerator; simply store the bulbs in a paper bag away from the crispers. The ethylene gas that some fruits emit inhibits bulb development. Keep them in this retreat for about ten weeks, and be sure to mark your calendar so you’ll remember to remove them. At the end of the cold period, pot the bulbs using a good potting mixture that has not been pre-enriched with fertilizer. Pots should be clean and have adequate drainage. One bulb is sufficient for a 4” (10cm) pot and three bulbs are needed for a 6” (15cm) pot. 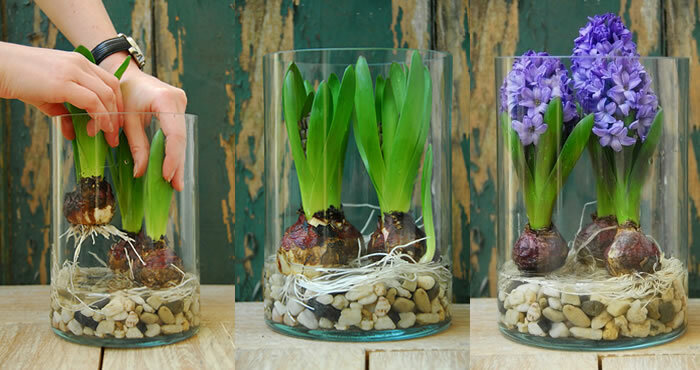 If you’re using a larger container, plant the bulbs as closely as possible together. When planting it is advisable to use gloves, since the bulbs contain organic compounds that can cause a skin rash. Move the potted bulbs to a cool, shaded part of the room for a week or two. As the flower buds begin to emerge, gradually expose the plants to ever brighter light. A bit of direct sun is useful, but fortunately it is not imperative. 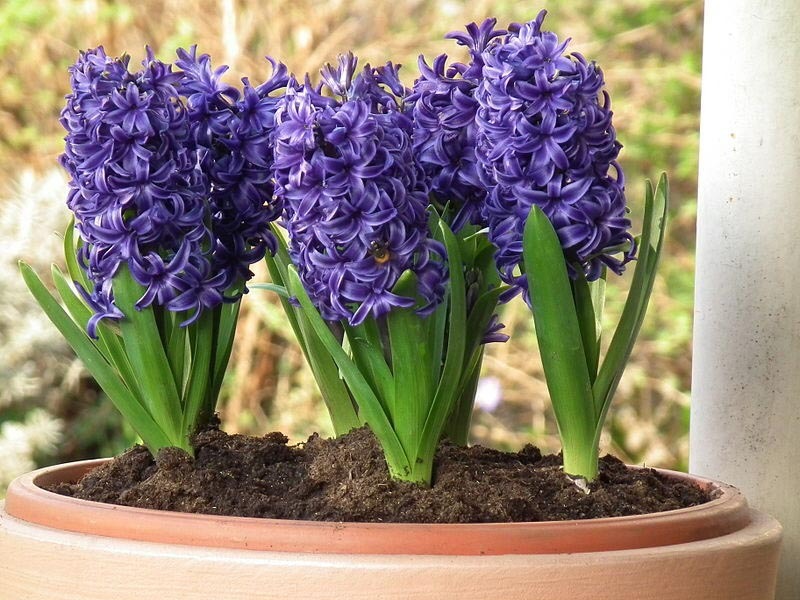 Once your hyacinths are growing indoors, they will flower in two to three weeks. If desired you can also lift the bulbs out of their potting material, wash off any dirt around the roots (just hold the end of the bulb under running water) and place carefully into a decorative glass container with some stones or hydro beads and a little water. Prolong the blooms by avoiding direct sunlight, but ensure that the plants get strong, indirect light. When the spring comes, plant them in the garden. Hyacinths can last for a number of years in garden condition. Thus begins the History of Thanksgiving on the History Channel’s web page. I admit that it has been more than a few years since I was in grade school (grammar school? elementary school? – the name continues to change depending on where you live). As a result of this time lapse, it turns out that there are many, many things about one of most beloved holidays that I either forgot or never knew. For instance, there were no pies! What?! – Thanksgiving with no pies??!! Also, it’s likely that the meal may have consisted mainly of venison. Most families have traditions surrounding Thanksgiving — a time to gather, enjoy being together, and not worry about buying or opening gifts. Like most Americans, our traditions involved the Macy’s Thanksgiving Day Parade (something that my mom still won’t miss each year), and watching football. Note: for those of us living in Wisconsin, the Thanksgiving football game between the Green Bay Packers and Chicago Bears will hold special significance and, I suspect, an incredible number of viewers due to the retiring of former Quarterback Brett Favre’s iconic number 4. For more information about the Thanksgiving holiday — both it’s origins and subsequent innovations — visit the History Channel’s complete coverage on the webpage. Have a blessed and safe Thanksgiving holiday! 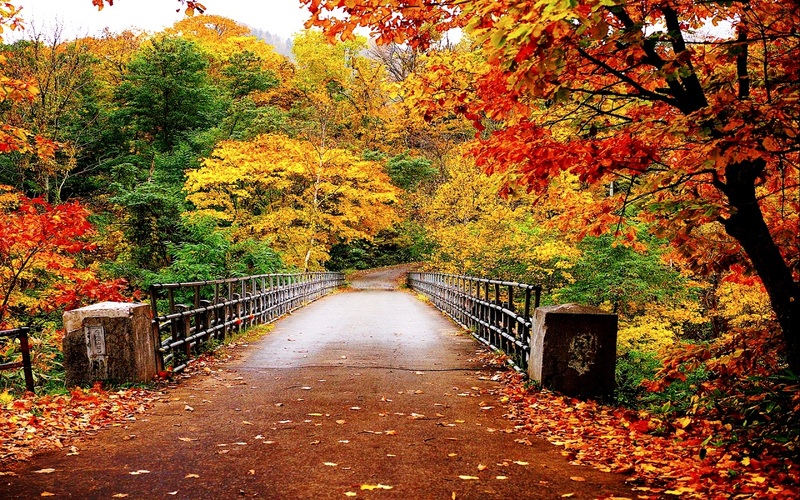 As we move into November, we are definitely feeling the change of the seasons. To some this may seem like the end of the gardening season. However, this is the perfect time to start examining your trees to determine what pruning needs, if any, they need. Trees in the urban landscape endure stresses not found in forest conditions and often pruning is needed to remove dead branches, improve structure, enhance vigor, or maintain safety. The best time to prune trees is during the late dormant season. Pruning at this time of year allows you to see the overall branch structure, it minimizes the risk of pest problems associated with wound entry, and it allows trees to take advantage of the full growing season to begin closing and compartmentalizing the wounds. It is especially critical to prune oak trees at this of year time (November to March) to limit the spread of oak wilt. Trees should be pruned throughout their entire life. However, if young trees are “trained” or pruned to promote good structure they will remain in the landscape for more years than trees that were not. These trees also have a lower potential for structural failure at maturity and require less maintenance later on. Before making any pruning cuts it is important to understand the biology of a tree and how it will respond in order to optimize the health and structure of your tree. Trees DO NOT HEAL, therefore each cut has the potential to change the growth of the tree and an improper cut can cause damage that remains for the life of the tree. No branch should be removed without a reason. Therefore, laying out your plan of action is important. Have objectives! This will dictate the type of pruning techniques to use. e.g. Crown thinning, raising, reduction, cleaning, restoration, etc. Each cut should be made carefully, at the correct location, leaving a smooth surface with no jagged edges or torn bark. Use the 3-point cut for larger limbs. By doing this, it will help the tree to optimize its “compartmentalization” process by which it limits the spread of disease through the wound site. Never remove more than 25% of the live branches of the tree. Wound dressing is not needed on pruning cuts, unless the prevention of certain diseases is needed (e.g. as oak wilt). If needed apply only a light coating of a non-phytotoxic material. Do not top your trees. Use the right tools for the job. Well-maintained and sharp tools will improve their performance. Do not prune near electrical and utility lines. Contact the utility company or hire a professional. Garden Clean-Up: How Much is Too Much? Here in Wisconsin we’re having incredibly wonderful weather for so late in the year. As a result, you may be tempted to just continually clean away the plants in your garden thinking “it will save time in the spring.” The question is not whether or not you can clean away all of the debris from your garden in the fall, but should you. “Twenty-some years ago, fresh out of college with a horticulture degree in-hand, I started teaching adult education classes at a local botanic garden. For many years, I taught a class called Preparing Your Garden for the Winter. I would show slides (remember those?) of how well-kept gardens should look in January. In the images, every plant was cut to the nub, except for the ornamental grasses and butterfly bushes, and the whole garden was snug under a thick layer of mushroom soil mulch. The roses were neatly trimmed to two feet and wrapped in a blanket of burlap, folded and stapled closed to keep them protected from freezing winds. There was nary a fallen leaf in sight; everything was raked up and hauled off. You see, that’s how we gardeners used to roll in the early ’90s, before we knew better. We’d cut everything down and “clean up” the garden until there was no shred of nature left behind. We’d turn the place into a tidied, controlled, and only slightly dirtier version of our living room. Everything was tucked and trimmed and in its place. Most of us weren’t interested in supporting wildlife much beyond hanging up a bird feeder, and the phrase “wildlife habitat” was only used in places like zoos and national parks. Unfortunately, many gardeners still think of this kind of hack-it-all-down and rake-it-all-up fall clean up as good gardening, but in case you haven’t already noticed, I’m here to tell you times have changed. Preparing Your Garden for the Winter is a completely different class these days. We now understand how our yards can become havens for creatures, large and small, depending on what we plant in them and how we tend to our cultivated spaces. Thanks to books like Doug Tallamy’s Bringing Nature Home, we now know how important native plants are for insects, birds, amphibians, and even people. Our gardens play an important role in supporting wildlife and what we do in them every autumn can either enhance or inhibit that role. To that end, I offer you these six very important reasons NOT to clean up your garden in the fall. 1. The Native Bees: Many of North America’s 3500-plus species of native bees need a place to spend the winter that’s protected from cold and predators. They may hunker down under a piece of peeling tree bark, or they may stay tucked away in the hollow stem of a bee balm plant or an ornamental grass. Some spend the winter as an egg or larvae in a burrow in the ground. All native bees are important pollinators, and when we remove every last overwintering site by cutting everything down, we’re doing ourselves no favor. We need these bees, and our gardens can provide them with much-needed winter habitat. 2. The Butterflies: While the monarch flies south to overwinter in Mexico, most other butterflies stay put and take shelter somewhere dry and safe until spring. Some butterflies, like the mourning cloak, comma, question mark, and Milbert’s tortoise shell, overwinter as adults. They nestle into rock fissures, under tree bark, or in leaf litter until the days grow longer again and spring arrives. Butterflies that overwinter in a chrysalis include the swallowtail family, the cabbage whites and the sulphurs. Many of these chrysalises can be found either hanging from dead plant stems or tucked into the soil or leaf litter. And still other butterfly species, such as the red-spotted purple, the viceroy, and the meadow fritillary, spend the winter as a caterpillar rolled into a fallen leaf or inside the seed pod of a host plant. If we cut down and clean up our gardens, we are quite possibly eliminating overwintering sites for many of these beautiful pollinators (and perhaps even eliminating the insects themselves!). 3. The Ladybugs: North America is home to over 400 different ladybug species, many of which are not red with black polka-dots. While the introduced Asian multicolored ladybug comes into our homes for the winter and becomes quite a nuisance, none of our native ladybug species have any interest in spending the winter inside of your house. Most of them enter the insect world’s version of hibernation soon after the temperatures drop and spend the colder months tucked under a pile of leaves, nestled at the base of a plant, or hidden under a rock. Most overwinter in groups of anywhere from a few individuals to thousands of adults. Ladybugs are notorious pest eaters, each one consuming dozens of soft-bodied pest insects and insect eggs every day. Leaving the garden intact for the winter means you’ll get a jump start on controlling pests in the spring. 4. The Birds: Insect-eating birds, like chickadees, wrens, titmice, nuthatches, pheobes, and bluebirds, are very welcome in the garden because they consume thousands of caterpillars and other pest insects as they raise their young every gardening season. Leaving the garden intact through the winter months means there will be more protein-rich insects available to them during the coldest part of the year. These birds are quite good at gleaning “hibernating” insects off of dead plant stems and branches, and out of leaf litter. The more insect-nurturing habitat you have, the greater the bird population will be. Your feathered friends will also appreciate feasting on the seeds and berries they can collect from intact perennial, annual, and shrub stems. 5. The Predatory Insects: Ladybugs aren’t the only predatory insects who spend the winter in an intact garden. Assassin bugs, lacewings, big-eyed bugs, minute pirate bugs, damsel bugs, ground beetles, and scores of other pest-munching predatory insects spend the winter “sleeping” in your garden as either adults, eggs, or pupae. To have a balanced population of these predatory insects, you have to have winter habitat; when spring arrives, they’ll be better able to keep early-emerging pests in check if they’ve spent the winter on-site, instead of over in the neighbor’s yard. 6. The People: If the previous five reasons aren’t enough to inspire you to hold off on cleaning up the garden, I’ll add one final reason to the list: You. There is so much beauty to be found in a winter garden. Snow resting on dried seed pods, berries clinging to bare branches, goldfinches flitting around spent sunflowers, juncos hopping beneath old goldenrod fronds, frost kissing the autumn leaves collected at the base of a plant, and ice collected on blades of ornamental grasses. Winter is a lovely time in the garden, if you let it be so. From bumblebees to honeybees, wasps to butterflies, and even some birds and rodents, pollinators come in all shapes and sizes. There are 22,000 known species of bee, but their numbers are dramatically falling. All bees are vitally important to this planet and all those who inhabit it, although some are deemed “better” at their pollination jobs than others; honeybees for example typically fare better than bumblebees. Bees prefer ‘single’ flowers, that stand alone and are well open to allow their stout bodies to access them – some great examples include daisies, dahlias, and irises. Double flowers, where there are lots of folds and structure, are more difficult for these insects, and are often ignored in favor of the more easily crawlable flowers. They also enjoy tubular flowers, which allow them to crawl deep inside the plant to feast on the nectar – flowers such as snapdragons, foxgloves, and honeysuckle are perfect. Bees seem to be especially attracted to the color purple, which is likely why they are often seen buzzing around lavender bushes. Other purple favorites include alliums, thistles, heather and geraniums. Hoverflies are masters of disguise – they look just like a bee or wasp until they land and you can see them better. They are incredibly docile and lack any sting or fangs whatsoever. 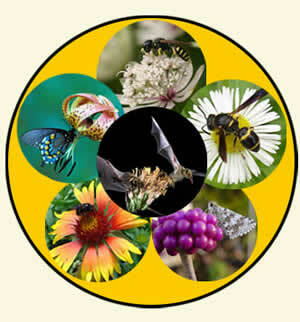 They are also very important pollinators, that are responsible for visiting flowers all over the world. They do such a great job in fact that they are widely considered to be the second best pollinators in the world, after wild bees. Another important fly to consider is the humble midge – we swat at their pesky antics in mild weather and probably swallow more than we care to think about when we’re trying to get about outside, but without these little blighters we would not have chocolate; midges pollinate the tiny white flowers of the cacao plant, enabling the tree to produce fruit. That in itself is worth a mention – thank you midges, and we promise not to get annoyed with you again. Pollinating flies don’t seem to be fussy – they have been spotted buzzing away on almost any plant. Chances are when creating a garden designed to attract the other pollinators on this list, these guys will also show up, eagerly getting in on the action. Like most insects, they benefit greatly from wildflowers that we often classify as weeds – dandelions, yarrow, buttercups and trefoil being just some examples. 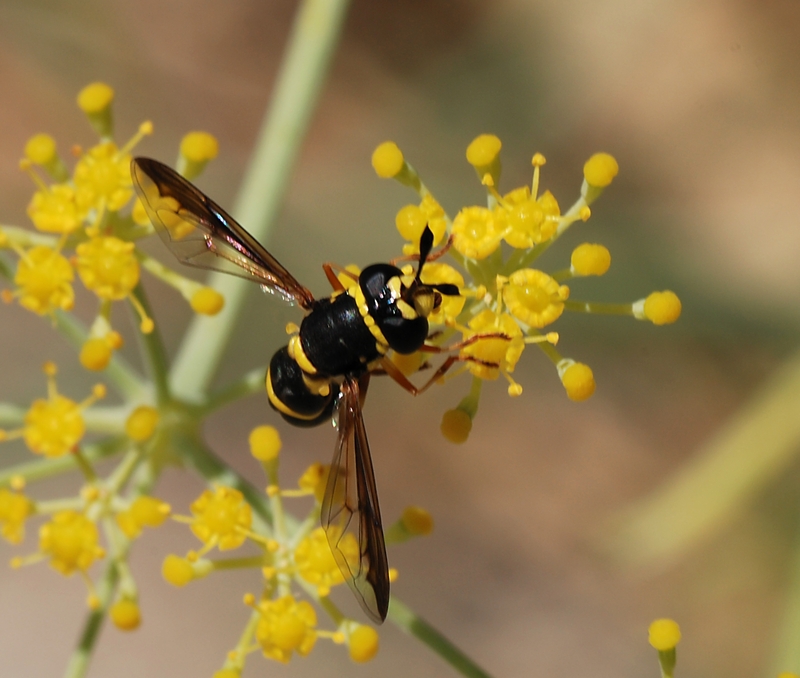 Unlike most wasps, pollen wasps are vegetarian like their bee cousins, being much more mellow in personality and happy to go about their business eating nectar and pollen. They are quite hard to tell apart from “normal” wasps. However, for the most part, wasps are harmless, and pollen wasps, in particular, do a wonderful job, rivalling that of our honeybees. Wasps, like bees, have very high demands for energy and favor plants that yield a lot of pollen and nectar, such as orchids, beardtongue, and waterleaf. Butterflies are beautiful additions to any garden, and they also pollinate our flowers, along with their cousins the day moths. Moths also have the added benefit of pollinating nocturnal plants, which release their scents and nectar at night when most other pollinators are asleep. Butterflies and day-flying moths enjoy many of the same plants as bees, but due to their long tongues can use many flowers that bees cannot easily reach. Some suitable plants include bluebells, clover, marigolds, pansies, and wallflowers. Night-flying moths rely on flowers that open in the evening and at night – examples include jasmine, some orchids, rain lilies, moonflowers, and evening stock. Beetles comprise the largest set of pollinating insects and were one of the first to ever begin pollinating plants – in existence! They are responsible for pollinating 88 percent of the 240,000 flowering plants globally – that’s a lot of work! Beetles are a handsome visitor to any garden, and despite their often slow and bumbling appearances, do a fantastic job at getting around fruits and flowers, pollinating them, and allowing the whole ecosystem to benefit. Beetles have a strong preference for fruit plants, and can often be seen eating from both the fruits and the flowers. They don’t seem to discriminate, being found on both single flowers such as magnolias and lilies, to clustered flowers such as goldenrod and yarrow. Beetles enjoy many weed species, and like the other pollinators mentioned, will benefit greatly from their inclusion in the garden. Here are four flowers bees need you to plant now. Why are some leaves red and others yellow? Autumn leaves of trees in North America often turn red. But in Europe the leaves mostly go yellow. Scientists think that the regional difference can be explained by the geographic orientation of each continent’s mountains. A new theory provided by Simcha Lev-Yadun of the Department of Science Education-Biology at the University of Haifa-Oranim in Israel and Jarmo Holopainen of the University of Kuopio in Finland proposes taking a step 35 million years back to solve the color mystery, says a news statement by the University of Haifa. “According to the theory provided by Prof. Lev-Yadun and Prof. Holopainen, until 35 million years ago, large areas of the globe were covered with evergreen jungles or forests composed of tropical trees,” the university said. Scientists have determined that leaves turn yellow when the green pigment, chlorophyll, recedes prior to the onset of winter, as trees prepare to shed their leaves for the cold weather. Leaves that turn red are the result of trees producing anthocyanin, a red pigment, which some scientists think is an evolutionary response that deters insects from laying their eggs in the trees. To read the entire National Geographic article, click here to visit the website. Whatever the reason, this is arguably the most beautiful time of year in cold-climate areas where the transition takes place — especially with small children who express such delight and wonder at the beautiful leaves. Why do my mums die? Everyone has pots of mums in Fall as part of the decorating landscape. However, when you plant them and expect those beautiful plants to pop up in your garden the next year, you’re oft times disappointed. Why? What went wrong? 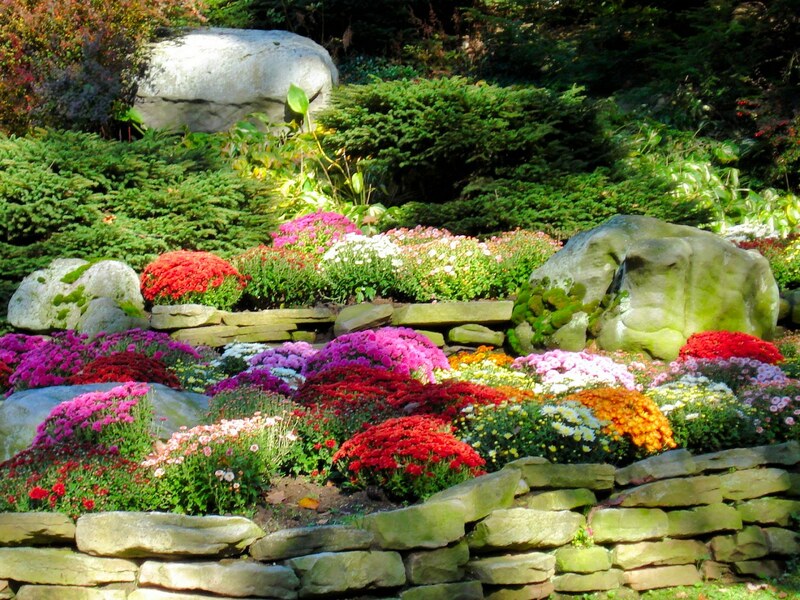 Improve hardiness by planting garden mums in spring. Many garden centers now sell mums for spring planting, thereby giving the plant time to get established before harsh weather. Those that are growing in your garden should be left standing for winter. The dried stems help catch snow and hold winter mulch in place. Cover plants with evergreen branches after the soil freezes. Increase winter protection by mounding 6 to 8 inches of soil over the dormant plants. Remove in spring as the temperatures hover near freezing. For best results, try planting hardy varieties like ‘Maxi Mum’ bred by the University of Minnesota and hardy to zone 3, or its hardy relative Chrysanthemum x rebellum. ‘Clara Curtis’, ‘Duchess of Edinburgh’, and ‘Mary Stoker’ are popular cultivars for cold weather areas. Remember to thoroughly water your mums, and all perennials, just before the ground freezes.